Allows to change the background color. Allows to specify your own city, so it would be painted in other color. Allows to change the globe's diameter. Allows to wait an initial delay to avoid some problems with PM. Allows to change the light intensity from the sun and the stars. Allows to use another directory to save the bitmaps. Is the same executable than beta 8, but all files are in a sigle ZIP. Allows to use an alternative image with 8 or 24 bits per pixel, and without any limit in its size. Allows to change the earth angle even when the option 'Static sun' is active, so the sun mustn't be placed in front of the user. Allows to maintain the background even when the user exits, or delete it, changing with the base color. Has an install program that creates an icon in the Startup Folder, so WarpGLOBE will start automatically each time that OS/2 boot. Better close aplication signal capture, so the program exits cleaner. Allows to be executed in idle Time priority, so the CPU usage will descend to 0%. Allows to change the number of stars to be painted. In systems without 4OS2, WarpGLOBE can't get the path with the standar C calls. Fixed, using OS/2 API calls (DosQueryCurrentDisk and DosQueryCurrentDir). 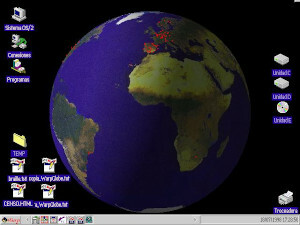 Close aplication signal is captured, so WarpGLOBE deletes all temporary files when its window is closed. Last image is deleted after the refresh interval, so it would be repainted right. Usage of dinamic memory, so it uses less memory. Pointer optimization, so it uses less CPU. Memory array containing the bitmap is cleared every time, so it fixes random points in the image. Control and configuration with easy-to-use menus. User can select the heigh of the cities'points, the refresh period and the ambiental light level for the dark zone of the earth. Now it can paint stars (optional). Sun can be static, so the earth will rotate to follow the light (optional). WarpGLOBE locks the users file, so it wasn't possible to change the list of cities without stoping the program. Fixed.